Don't forget the flickr group. 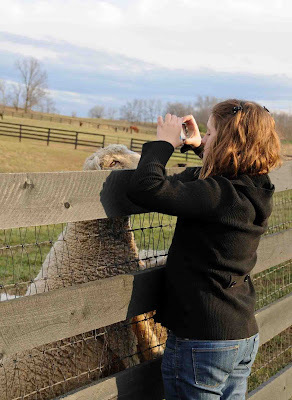 If you aren't familiar with flickr, it looks like basically you set up an account, upload your pictures to your account and then add them to the Hug A Sheep group. If you have any problems, let me know. Can't wait to see everyone! 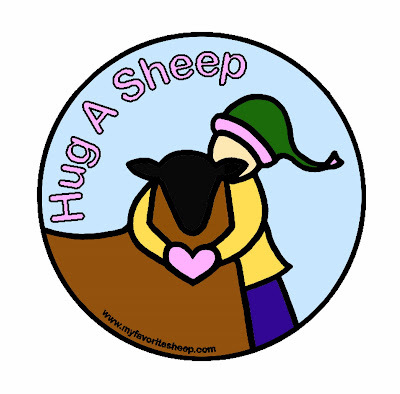 It's Hug A Sheep Day! 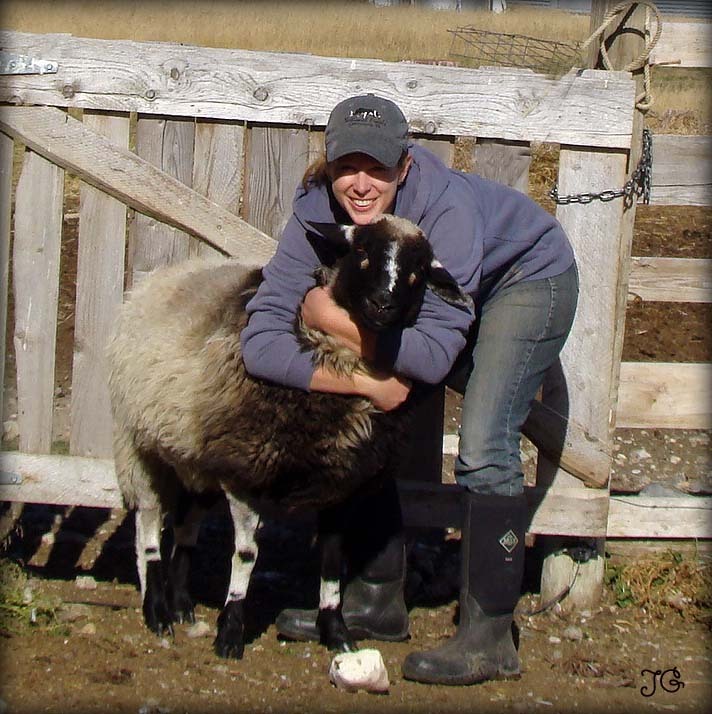 And our first submitted picture makes it INTERnational Hug A Sheep Day! This is Jenny Glen and Chocolate and Vanilla Swirl from Alta-Pete Stockdogs in Alberta, Canada. We hope everyone has a great day! Let us know who (or what, for all the yarn huggers ;-) you got to hug and if you post a picture, leave a link in the comments for everyone to go see. 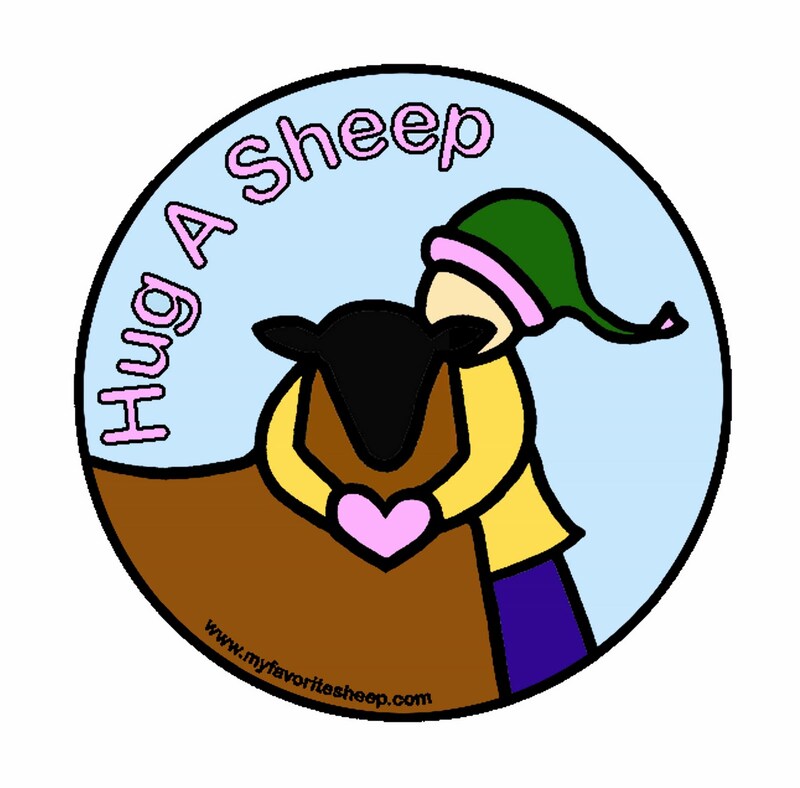 And remember - everyday is a good day to hug a sheep :-D.
I'm working with a local print shop to determine the feasibility of actually screen printing shirts, hoodies, bags... In the meantime, since time is short and I know folks are wanting shirts for this weekend, I decided to test the Avery transfer paper from Wal-Mart. 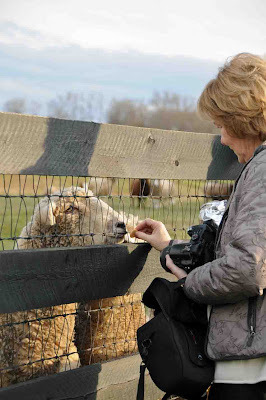 I have this image set up as a brown sheep or a white sheep. 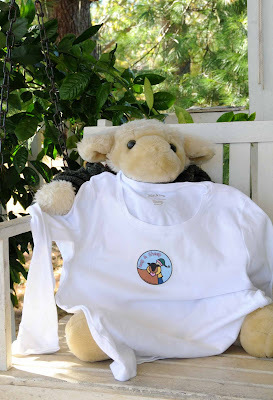 If you are printing on a light colored shirt, you need to reverse it - follow the directions included with whatever transfer product you choose. I've only tested the white and it looks like it worked just fine (click to biggify). The reviews are mixed on how well they'll hold up, but the t-shirt was $6 and the transfer paper (for a whole package) was about $8 I think. If you'd like to make your own t-shirt for this weekend, send me an email letting me know which color you'd like and I'll get a high resolution file sent out as quickly as possible. Like a free downloadable knitting pattern, this is for your personal use only. If you'd like to make and sell t-shirts, talk to me first. We can probably work something out if there is a good charity involved. For an easier, but slightly more expensive route, I set up a Cafe Press shop. I've not seen the final product, but it "looks good on paper". For the free, not for (your own) profit shop, they'll only let you set up one design, so don't be looking for other colors or sizes of the logo... Still, I think a pink tee that I didn't have to worry about ironing on crooked has it's appeal ;-). We're going to keep this really simple this year and just have some fun. 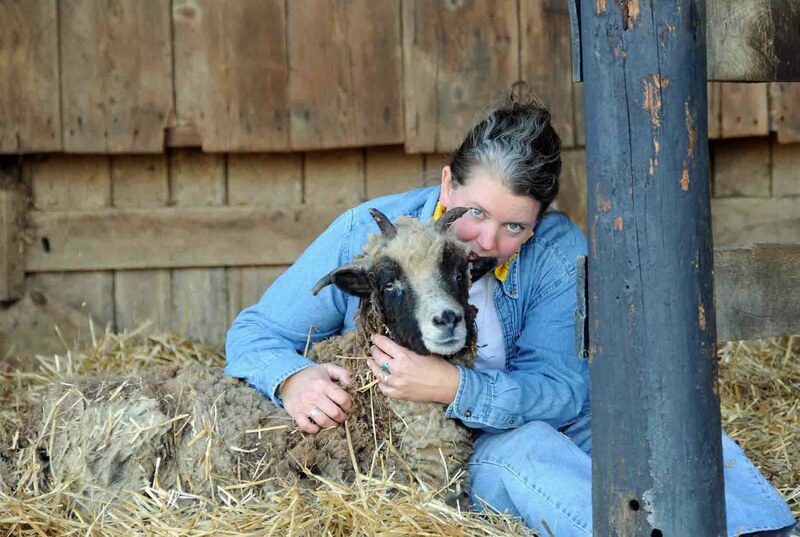 That's what sheep are all about anyway, right? HASD is for everyone to enjoy. You do not have to have your own sheep, even know anyone who has sheep. If you'd like to be listed as a participant (individual or group), leave your name (and a link if you'd like) in the comments and I'll start a running list. If you (farm, LYS, guild group...) are planning something special and open to the public, drop me an email and we'll try to feature you somehow. 2010 Hug A Sheep Participants - I'll keep adding everyone as quickly as I can, so if you don't see your name somewhat promptly, let me know! I'm learning way more about graphic design that I really wanted to have time for, but I'm pretty happy with this as a logo. What do you think? The colors from my desk top vary from the lap top, so I'm not sure how it "really" looks. Right now, on this screen, the blue background is a little dull and the pink in the letters, while the exact pink of the mitten heart, looks dull too. Argh - now that it's posted, I see that the transparent background really ain't that transparent. Sigh. Tomorrow. We're going to make this up as we go along. Stay tuned!